# 4978. 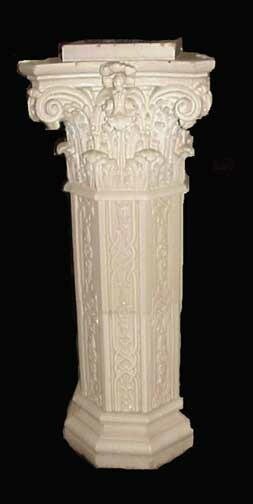 This pedestal was made from an architectural element: a pilaster. 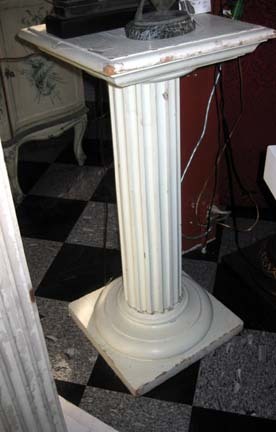 The carved capitol and fluted column was part of a doorway surround. The antique elements are definitely Greek Revival - 1840 - and knowing this style and era, we believe that the work is the design of the famed American Architect Russell Warren. The base, back and top (marble) are new and were used to created the free standing pedestal. Size: 59.5" tall; the base is 17.5" square and the marble top is 16" x 20.5". Price: $1,650.00. # 3289. A very simple wood pedestal. Probably circa 1875. Size: 37" tall with the top and base being 16" square. The simple fluted wood column support a wood top and base. Old white paint. Price: $650.00. # 4648. Scagliola columns are rare. Made of plaster with wood frames, this example is classical in form and decoration. Age: 1845-50. Condition: some staining to the surface; chips to the top and base. Size: 35" tall; the top and base are 12" across. Price: $2,500.00. # 3953. This is a very heavy iron pedestal. Circa 1890. Size: 37" tall; the top is 9.75" square and the base is 11.5" square. Condition: rusts across the entire surface; old marbleized surface with scuffs and paint loss. There is a wreath in relief in the upper front area of the pedestal. Price: $825.00. # 4007. A Aesthetic era pedestal. Brass and wood. Size: 40" tall; the top is 9.75" square and the base is 10.5" square. Condition: there is a gallery connecting the 'legs' on the base of the pedestal - one of the gallery elements is missing; The top and base are silver leaf wood with scuffs to the surface. Price: $1,650.00. # 5012. A pair of monumental Grand Tour Carved Marble Urns. Each is 51" tall and the base is 12" in diameter. Made between 1840-50. Italian. 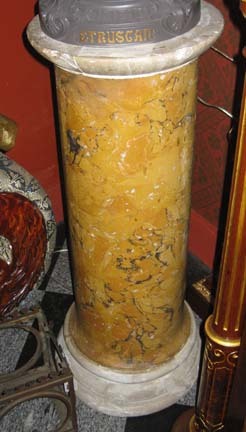 The dark marble bases are made of Portoro Marble. This marble has been mined in La Spezia Italy since the 16th century. It is a hard calcareous rock with black and yellow streaks. The base is solid. The urns were made in several sections and cemented together with plaster. The opening at the top is 6" diameter on the inside of the foliate carving. We suspect that these pedestals were used as lamp holders. They could have easily have held either a candelabra or carcel or moderator lamps. Condition: there is evidence that there were foliate 'ears' on either side of each upper urn section. A hole has been filled. The base to one of the urns has had restoration. These urns bolt together. 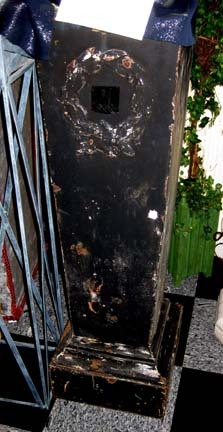 We do not know the type of white with black veins stone composes the urn sections. We do not believe that it is alabaster; the urns may be Arabesqued marble which was mined in the Apuan Alps in Italy. This type of Grand Tour item was purchased and shipped back home. From a Padenarum Mass. private residence of note. Price for the pair: $7,950.00. # 5169. 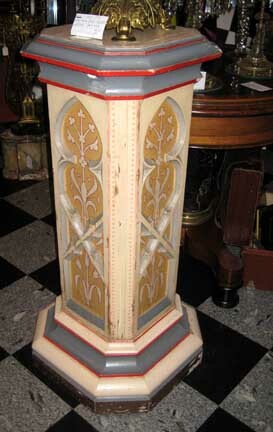 A matched pair (2) of Polychromed Gothic Pedestals. Size: 40" tall / base is 19" square / the top width is 16" square with the usable top surface being 12" square. Polychromed / painted decoration / recessed Gothic framing on each of the four sides with stylized Gothic design elements painted inside the recessed areas. Condition: considerable worm holes / scuffed and flaking painted surface. Age: between 1865-95. Probably American. Price for the pair is $3,950.00. # 5219. An American Aesthetic Movement pottery pedestal. Manufactured by D.F. Haynes Pottery, Baltimore, MD. circa 1885-90. Size: the top is 12" across with a usable surface 9" across; the pedestal is 24.5" tall. Condition: scuffs consistent with use and age. There was probably a companion jardiniere made for this decor at one time. Price: $1,350.00. # 3767. A ceramic / pottery / Pedestal. Made between 1890 and 1910. Thickly glazed dull white surface over a solid composition material. Size: app. 42" tall and the top will support an object 9.5" across. Condition: various flakes and glaze crackelature. This is a very heavy stone like pedestal. Probably made for an indoor conservatory or to be used outside. We had this in our garden for a couple of years with the Newport, Rhode Island cold not affecting the integrity of the pedestal. We have seen a turn of the century catalogue from the firm of Liberty of London that pictured similar garden pedestals and this (unmarked) pedestal may be from the firm of Liberty and Company. Difficult (but possible) to ship. Price: $4,500.00. The Drawing Room and The Zsolnay Store is located at 152-154 Spring Street, Newport, Rhode Island 02840.We are open daily from 11 am to 5 pm and by appointment. If you have an interest in an item listed in this document or wish to purchase an item, please call us at 1-401-841-5060. The Partnership of Gacher and Santi has been in business for over 40 years. We have been located in Newport since 1985.